Learn how to clean your gun! We’ll go through our recommended cleaning tools, the proper procedure, how often you need to clean, and end with an all-inclusive video. Everyone and their mom has their preferred way to clean and lube a gun. Find a forum on the subject and you’ll hear dozens of preferences of the “best” solvent/oil/grease combination. So is our way the best? Maybe, or maybe not, but it’s worked for tens of thousands of rounds through pistols, rifles, and shotguns. But don’t worry, we’ll also list several other popular options. The best way to start off is to buy a simple cleaning kit that has everything you need. 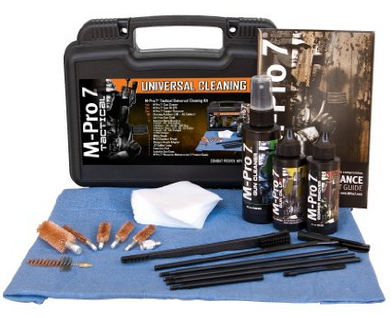 Our recommendation is to get the M-Pro 7 Tactical Universal Cleaning Kit. It has bore brushes for almost all calibers, a cleaning rod that works for pistols and long guns, as well as cleaning patches and all the necessary fluids. Or just buy the necessary solvents and create patches out of whatever you have handy. 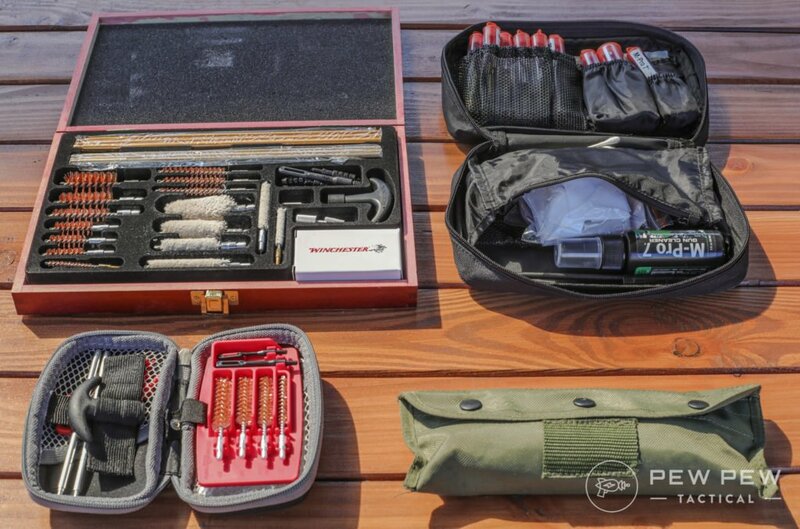 Check out more of our picks in Best Gun Cleaning Kits. You’ll also want a lot of Q-tips, an old but cleaned toothbrush, and a rag (I use old t-shirts or microfiber towels). Once you run out of patches, you can get additional ones from Hoppe’s. The two main reasons are that it works well and does not smell. 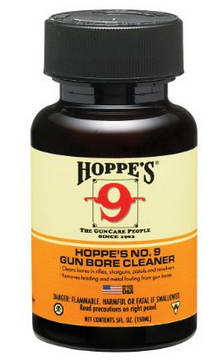 I originally started with the OG of all gun solvents, Hoppe’s #9. Hoppes has been used for decades and really does the job getting all the gunk out. It also smells really awesome in a gasoline kind of way. So you want full ventilation outside and be careful of getting it on your hands. A couple headaches and a damaged (to this day) fingernail taught me my lesson. M-Pro 7 Gun Cleaner gets rid of carbon buildup just about as good as Hoppes but is non-smelly (I mostly clean indoors) and doesn’t destroy my hands. But I’ll admit, I still spray some Hoppes #9 on my gun for the smell and wipe it off as a finishing touch. I’ve found gun oils to be essentially the same. As long as you keep your gun clean and oiled you’ll be fine at the range and for home defense. M-Pro 7 Oil keeps my guns running fine even with 500+ rounds a day in the desert with small sand particles flying around. M-Pro 7 Copper Remover gets rid of copper in your barrel left behind by bullets. Works great and doesn’t smell as terrible as others. You’ll also see much argument about using grease on some areas. The standard saying is to use grease where things slide, and oil where things turn. For me, I use grease on rails since when you put it on there, it stays. 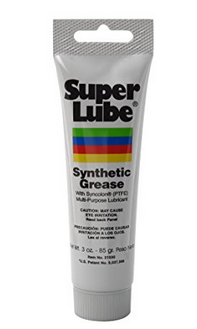 My preferred grease is Super Lube. Remember to use sparingly since it does seem to attract contaminants more easily than oil; that tube should last long enough to become an heirloom item. Here’s a great video that covers almost everything we talked about above. You can see that he finishes everything in about 5 minutes. In the beginning I cleaned after every trip to the range, even if I only shot 50 rounds in some of my guns. I like cleaning as much as the next guy, but it got really boring really quickly. Now, I field strip and clean about every few hundred rounds for my pistol and semi-auto rifles, and every 100 or so rounds for my precision rifle. I’ll still wipe down the rails and add some lube before I head to the range just in case. 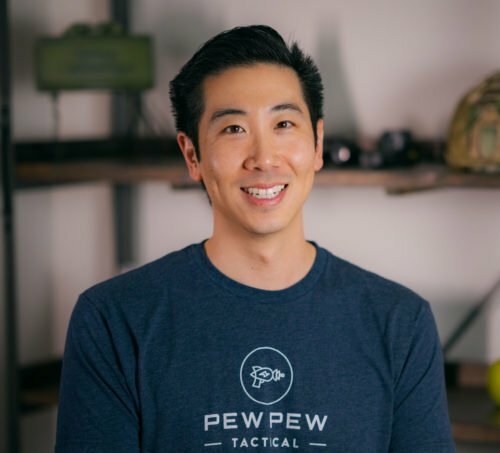 Many guns will probably run fine for thousands of rounds with very little maintenance, but a great analogy I heard is relating gun cleaning to showering. Sure, you don’t really have to shower all the time, but many people would appreciate it if you did. I would prefer to depend on a gun that has been cleaned and oiled regularly. And I would prefer to depend on others who regularly clean their guns too. If you noticed, we omitted using the copper remover in the above procedure. Some people use copper remover every time they clean, but I think that is overkill unless you are in extreme accuracy competitions like benchrest. I will use copper remover only maybe every 2000 rounds for my handguns and rifles, and every few hundred rounds with my precision rifle (or when I start seeing some accuracy issues). I add in copper remover steps after I clean my barrel normally…just put some on a patch, wait, and clean it out. I detail strip and clean all the components whenever I decide to use copper remover for my barrel. Most of the inner guts do not get too dirty in normal environments. Only one thing I can recommend: Break Free CLP is a wonderful LP but not a very good cleaner. I used it for a while, was never able to pull out a clean patch even after an hour of cleaning. Then I switched to Hoppes and MPro7 and they picked up a lot of leftover gunk. and my patches are clean. I agree with Smith’s comment. Can you recommend an AR-15 cleaning kit? Well-written post and very informative too. Just so glad to have read something like this. As far I as remember, this is the first article that I’ve read which is about cleaning a gun. And you did a great job on this. Thanks for sharing.